A friend of mine sent me a picture of us at a con last year standing next to a Dalek (in case it’s not obvious). After I got the pic I made up this before and after picture to show the extent of my weight loss. I showed my new doc and the receptionist at her office. They were both shocked and said they never would’ve guessed that it was me in the before picture. I think it still looks like me and the people that have known me longer would agree. 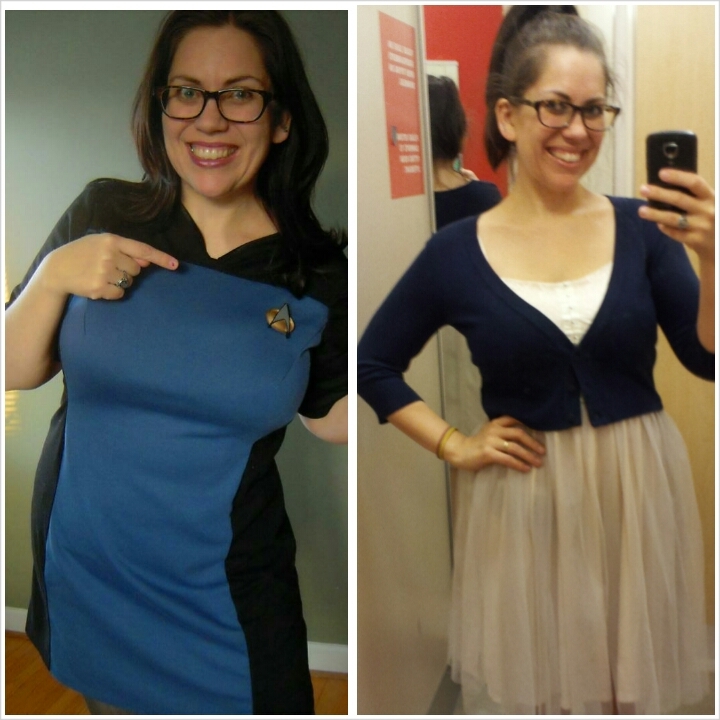 The photo on the right is one I posted to IG from a day I was having fun trying on clothes at Target. The more I looked at this picture, the more thoughts came to mind. Before pictures are always staged. You put the person in ill fitting clothes with no make-up and tell them to look serious (or so it always seems). I feel like my before and after pics above look staged. The picture on the left isn’t the most flattering outfit I’ve ever put together, my arms behind my back are for who knows what reason that doesn’t read in the photo. The picture on the right has me wearing a more flattering neckline from the navy blue cardigan and I’ve got the hand on the waist thing going. And of course I have a less goofy face- which to me is always awesome. Goofy faces FTW! Someone promoting a diet or exercise routine would totally use the above picture as a way to exaggerate the outcome IF you use blah blah blah. The difference is very apparent. But of course I can’t stop there. I had to pull out one of my favorite pictures from my blog next to the newer picture: my skant pic! I love it and when I set up a new before and after it reveals more about how I actually feel about myself. The big disclaimer on having no complaints about my body at any weight is that I have always wanted clothes that fit. That’s all. I don’t care about the size. I just want them to fit. Well fitting clothes make me feel better, too. I know I’ll be more comfortable if my pants aren’t cutting into my sides or if I can’t raise my arm in a top or dress. It’s all about fit for me. Cue the sewing machine. Get the fit that’ll make you SMILE! This before and after more accurately communicates of how I feel about myself. It says, “hey, this person leads a full, enjoyable life.” And, of course, it says that I love Star Trek. How do you react to before and after pictures? Do you ever get annoyed about how staged they are? Do you have pictures of yourself wearing something you wish you never had worn or glasses that made you look like an owl? (yeah, that would be me!) What’s your internal monologue about these images? What a good post! 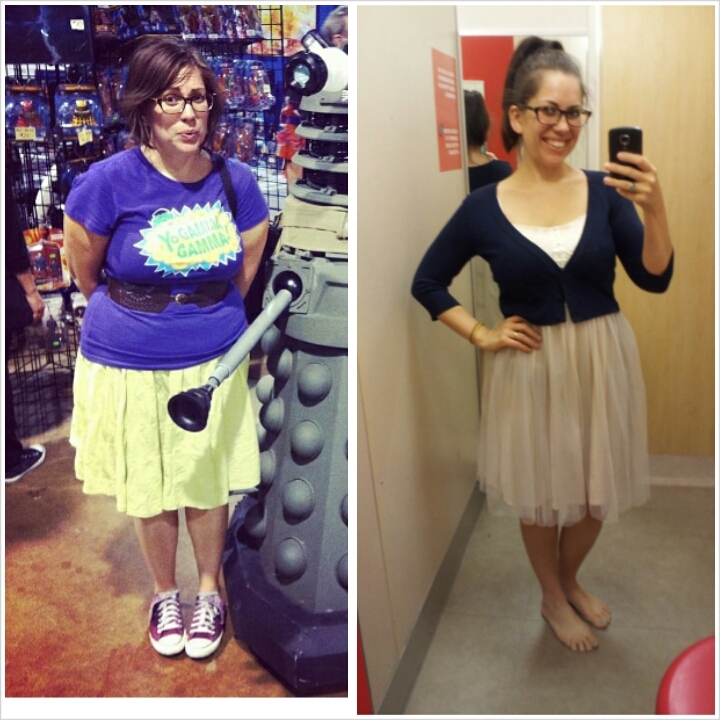 I like your second before-and-after picture better too, and i do think they are more representative… but then, maybe my view is skewed because to be honest, when I see the dalek picture it reminds me of my own figure! Somehow my brain says, “See, Leila used to look like you and now she’s all skinny…” and then I have to remind myself that you’ll still like me no matter what! How odd is that? I’ve had that thought process every time I see that pic tho, so I guess it’s consistent? On the other hand, I’ve been thinking lately how I’m really liking pictures of myself more and more these days. I’ve actually gained about an inch everywhere since I started blogging, but I feel happier and prettier in the clothes I make now! I love your comment and you know I love you Gillian. Nothing will ever change that. It’s interesting, even with positive self body images we have of ourselves, how our brain plays tricks on us. It takes a lot to filter out the stuff we see and hear both consciously and subconsciously. And you do look great in your pictures! I don’t know what you’re doing different but you look amazing. Must be all those awesome pants you keep making that fit like a dream! Gillian, I saw your leggings post and your backside with nothing to hide it, LOL, and you look like a rock star! Seriously. I REALLY like your post today. It would be wonderful if we all learned to love ourselves without stereotypes. I had to laugh about the staged before and after photos. I’ve often thought the same thing. Thank you. I’m glad you liked it. Sterotypes are so hard to filter out. I think a lot of us are awake enough to acknowledge them and separate them from our own thinking but it’s hard. Before & After photos are always so posed looking. (Not to mention bad lighting for before and good lighting for after.) I always like photos of people being themselves better. And I can see the confidence and happiness in all your photos – the first old “before” is just you being your goofy self without thinking about posing in a stylish way. If your clothes fit, you ALWAYS look better and it gives you more confidence, no matter what your shape or size. Just look at the reality show contestants (especially American Idol!) and you will see what a difference having a stylist and a tailor makes. Same goes for guys – put a sloppy dresser in a nicely fitted suit or tux and it is instant makeover even if he doesn’t shave or get a haircut. Oh yeah! If we all had stylists and tailors it would make a lot of difference in how we saw ourselves. so true. Interesting also about the background. Isn’t that interesting. Great comment, as always, Brooke. I love your input. Leila, I love that pic of you in your ST skant! I agree it is a much better before and after representation. Congratulations on your weight loss. You look healthy and happy. I have so many thoughts and words about this topic that I almost didn’t comment… you know, sometimes there’s too much to say to even start? 🙂 Anyway, the first bit of snark I always want to hurl at a B&A pic duo is to list all the things that are applicable *before* and *after* — the least of which might be actual weight loss. (lighting, makeup, smile, life, clothes, etc. etc.) But my biggest gripe is the see-how-happy-she-is-now-that-she’s-lost-weight myth, like that’s the key to a great life. So many of us cling to that belief for so long — I did, for decades. It breaks my heart. Most importantly — your gorgeous Leila smile is my favorite thing about any picture I see of you, and you’re right, it’s exactly the same now as it was a year or more ago. 😉 MWAH! I’m so glad you did comment. I know it takes effort, especially within this complex context. I couldn’t agree more. This whole notion that losing weight makes you a happier person! Bullocks! And thank you. I am a happy person and I love smiling. That will never change no matter how different my physical appearance. Great post. I have always felt you were happy being you, and I have always loved you as you were! I love the goofy picture face personally, and think the picture is cute. My wedding pictures are my before pictures. To be honest I’m glad, because even then I was happy that day and have come to terms with being beautiful that day despite all the extra weight. But, at the same time those pictures inspired me to lose 70+ pounds which I did over the course of the next year or so. I try to tell myself I was more concerned about my health, but to be honest my body image has always been a struggle for me. I’ve gained about 30 of those lost 70 back and am on the road towards losing them again. The past 2 years were a rollercoaster for me, and I reverted to poor habits. Until recently. This time though, I am doing it more for my HEALTH than the looks. In the past 7 years, I have grown to accept my body and love myself more for what I am and accomplish as opposed to my body. I have learned that thinness does not make someone happier, but eating healthier and exercising makes me feel 10 years younger and I am so much happier. I found myself, a few weeks ago in what felt like a funk of gluttony – and in just the past week and a half I have made more health-oriented decisions in my actions and meals and I already feel so much better. Not just emotionally but physically. I do agree – for the most part before and after pictures often enhance the worst of us, then the best of us. Thanks for this post. What a compliment… even thru the crazy college years. 🙂 I’d have to say the same about you. Wherever I think of you, you have the greatest smile. Wow. 70lbs. That’s intense. Feeling healthy is definitely what has propelled me to do this and the weight loss is actually a surprise. I’m fine either way, y’know? Anyway, thanks for the awesome comment, Lara. Great post Leila! I think before and after pics and makeover shows, etc. are a bunch of hooey. I once saw pics that somebody posted of a famous British nutritionist, who happens to be a vegan, up against pics of total meat eaters. The pic of the nutritionist, she was scowling, frowning, and had her head tilted down in a most unflattering pose in bright unstaged lighting. The pics of the ‘meat eaters’ were hollywood starlets, all dolled up in make-up and dresses on the red carpet. I mean really? This is a fair comparison and any kind of commentary on diet? Puhlease! By the way, Leila, my FAVE pic of you is the one in your Star Trek skant. You look happy, unselfconscious and natural. And beautiful! In terms of weight, bone structure is often the call for that. Somebody with a large bone structure and is naturally fuller, looks rather sickly when they attempt to lose weight to look like a ballerina. Whereas the opposite is often true. Somebody who has a very delicate bone structure and is naturally thinner, tends to rock the skinny. So, I think it just doesn’t work to impose ‘weight loss’ as a universal idea that everybody should do. Yeah, those shows are ridiculous. Thanks for adding to the conversation. Reeeediiiiiiiccccuuuuulous! 🙂 I want to add to the last paragraph of my comment. It was meant to be a shout-out to folks that are naturally skinny, like me. When I was reading your post, the part about the eating disorders struck me because I eat and eat whatever I please and this is how I look. I have been the same weight since high school. And, I have been accused of having an eating disorder, made fun of, and complete strangers on the street have come up to me and grab my wrists and remark on my weight. So, I was trying to give an “it’s okay to rock the skinny” to folks who really are just built that way and are in no way trying to lose weight. I’ve tried and tried to gain weight to no avail. Isn’t it funny how the grass is always greener on the other side? LOL. I think the best things about you have not changed a bit. Your smile, your sense of humor and your intelligence are all constant. The before and after pictures shown on ads always exaggerate the effects of losing a few pounds. “Lose a few pounds and become sexier, prettier, more stylish and chicer!” Yeah, right. You stay yourself with less weight. You nailed it. Wow. This is quite the compliment for me. I do think we are how we are and there isn’t too much I can do about it. Especially when it comes to my sense of humor. 🙂 Thank you so much. I will say it again, great post. So true. Your star trek picture is very cute! For me its all about TNG. Thank you! yeah, those skant pics were fun to take. I was in such a goofy mood that day…and most days, come to think of it. This is a great post and there’s really nothing more to add than what’s been saod already. I remember Trinny and Susannah going on and on about the importance of clothes that fit well, if you’re big in too small clothes you will?look bigger than if you wear your correct size. That said, I think all your pictures show how you are, just looking different in them all. I’ve been following The Body Ecology Diet. It’s worked really well for me. It is strict but I’ve gotten used to it. Didn’t we chat about this a bit ago? I was saying you look beautiful either way but I was happy that you are FEELING better? Fantastic post. The fact is that most of us, for a variety of reasons at a variety of life stages go through chances in size and shape. I totally concur that the only thing that matters is clothes that fit beautifully. Cuz in the right clothing, all bodies are beautiful. (I don’t know why this is such a mystery to everyone?!?!) I def find that I have a weight at which I feel and look best. Well, I know I feel best and I think I look best. That tends to be not as lean as I want to be but not as fat as I have occasionally been. I’d be lying if I said I’m not critical of myself in photos when I get to the weight I don’t like. But, objectively, I’m less “attractive” when I’m too thin than when I’m slightly heavier. Ah, it’s all food for body-acceptance thought. In general, however, I’m on your page. I live well and I’m grateful for this body I live in. I try and bring love to the equation. I know, right? The “all bodies are beautiful” part really seems to be lost on some people. There are those that feel only stick thin is the way to be and those that feel that big curves and big ‘girls’ are the way to be. Can’t we all just get along??? 🙂 I think most people look best at their ‘natural’ weight, i.e., the one where you stay at a steady number when you aren’t obsessively dieting to either gain or lose weight. Some fitness magazines have started talking about your ‘happy weight,’ which is the same idea. And I wanted to add on to the ‘there is only one way to be’ thought. Those ‘Real women have curves’ posts have always bugged me; I’m not particularly curvy, so what is that telling me? Yes. My point. I worry that in our zeal to promote all body types, we forget that real woman may actually also not have curves. And, I mean no curves at all, surgical breast removal, hormone imbalances, high testosterone all leads to very little or no curves. It doesn’t make a person any less ‘female’. Everybody’s body type is different and before and after pics often gloss over this fact and simply try to push some unattainable “ideal”. Thanks for posting this, Leila. It is important to keep things like weight and happiness separate. My weight has nothing to do with my happiness. Sure, I am a bit heavier than I would like, sure I would like to lose some of that weight. But, I won’t be happier if I do. I will still be me. THIS IS WHY FIT IS SO IMPORTANT!!!!!!!! If I could bang one message into everyone’s head it would be this! It doesn’t matter your size if you’re wearing properly fitted clothes. Yes to everything! Honestly I think you look great in both of the second set of photos. I wanted to add to the conversation. I agree with the previous posters. You’ve always looked great. Attitude is key. I do think you look younger in the Target photo and that may be because you are in a more put together outfit. You aren’t comparing two equal things. I love the Star Trek skant. You could put it on and do an identical pose to have a real before and after. Also how far away the camera is affects our perception of a person’s size. I never thought about documenting my weight loss journey in photos because I don’t think about photos and I don’t usually worry about what I weigh. However, I did find a photo of me wearing a bright orange shirt and a fanny pack squeezed around my waist. So I did do a similar photo minus the big Olmec head in the background wearing the same top and I’m due to do another one. One thing that irks me about most before and after photos online is this. The befores are usually without any makeup, drab hair and stark pose. The afters are beautifully made up, hair is styled and the person is often standing in a way to minimize flaws. The right bra can take five pounds off your appearance! Agree with everything. Attitude is huge. Also, posture is huge factor in the after photos, We should do a series of opposite B&As with unflattering shots of ‘skinny’ (or fit, or whatever they are selling) befores and flattering fuller-figured afters. That would be something to flood the internet with. I totally agree that the most important thing is that the clothes fit right! I’ve actually be working on a post somewhat related to this – and I have to say that sewing has been one of the best things for my body image and trying to get myself out of the “before” mindset. I’ve definitely had that “oh, if only I did this, if only I were skinnier, this would look so much better on me” thought, and sewing has definitely made me feel like when things don’t fit, it’s not my body’s fault it’s the garment’s fault! Especially after figuring out only a few of the adjustments that I have to make to get patterns to fit well, it explains completely why RTW stuff usually doesn’t look that great. On a separate note, you look so happy in your second photos and that is really great! I think we can take flattering (and unflattering!) pictures at any size/point in our lives. Even movie stars have pictures that show them at less than their best. As you said, you look fabulous in the Skant, and while I don’t think you look bad in the other “before” pic, I do think you look better in the other two. But, I also think those other two fit the image of you I have in my head better, so maybe that’s what influenced me? I love this, and I feel like in the 2nd before/after you look great in both photos. Just having a smile on your face and a well fitting outfit really does make a difference. Your post is great. It sends a good message about clothes that fit are important. I’ve been through a few sizes myself and I love making clothes for my family so they look great. This gives me practice in getting the fit right for any shape and that’s what I enjoy passing on to others when I sew for them.